Source: Thanks to Hachette NZ. 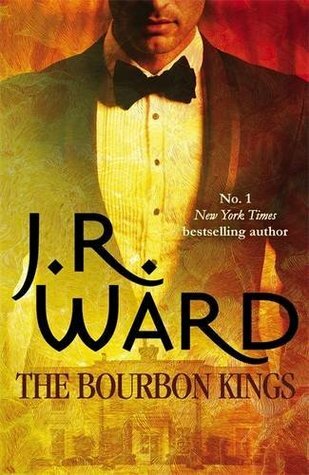 The Bourbon Kings is the start of a new series by J. R. Ward set in the southern state of Kentucky. The Bradford family for generations have produced a fine number of bourbons that have given them wealth with all the privileges that go with it. But the Bradfords are also a seriously dysfunctional family. The mother lies in a drug induced stupor in her bedroom - we never really meet her as such. She is the Bradford side of the family. The father is as evil a character as you will meet anywhere. He leaves a stench wherever he goes. He could very well be the downfall of this business. Edward is the eldest of the children, and can he tell a story of how his father's evil, corrupt and abusive ways have touched him. Maxwell we only meet as a child, he is a shadowy figure yet to have his story revealed. Lane when the book opens has just returned to the family home because his mother has been ill. No, no, not the one in the room upstairs, but his chosen mother - Miss Aurora the cook. For all intents and purposes any humanity in this family can be traced back to her I am sure. Lane was in love with Lizzie the head gardener but things went south and he has never really recovered. Now he meets up with her again. Virginia or Gin is the only girl, she seems spoiled and indulged, but there is most likely more to her story that will give us greater understanding about her on down the track. In the meantime I fear for her - she is about to sell her soul to the devil. They seem to be an alcoholic and promiscuous family on the whole. So privileged they don't even know how to pack a suitcase! This is the story mostly of Lane, his development as a man going from nowhere to perhaps somewhere, finally ready to stand up and be somebody. It is the story of the reawakening of his relationship with Lizzie - who can pack a suitcase and a whole lot more! She is intelligent, strong and independent and she is not prepared to be mucked around with. However she does know how to admit when she is wrong. Edward is fascinating and out of all the family I want to know more about him, and I want to see him reclaiming who he must obviously have been once. He has guts, but there is too much cynicism and reliance on alcohol. Not that I am judging! He's been through hell. While this first book has a conclusion of sorts, more like a deep breath pause, the story of this family is in no way finished. We are left with a bit of a gory cliffhanger. I can live with that but I will be surely waiting for 2016 to swing round and hopefully it will bring the next episode in this family soap drama. I'm looking forward to reading this! Ward does have an addictive writing style, doesn't she? I was so excited to be approved for this one on Netgalley, but you know I haven't even gotten a chance to try it yet. And shamefully, I've only read one other book by this author - the first in the BDB series, which I loved. But, cliffhanger?! Ugh, I hate those. Still, this sounds like a book I will enjoy, if I ever manage to get to it! Great review - I'm glad you liked it! Hope you get to it sometime Brandie, quite different though to her BDB. Cliffhanger wasn't too bad, but certainly sets up next book. Not as bad as a Diana Gabaldon book cliffhanger a few years back where she left a kid in a tunnel and we had to wait for a few years to find out what had happened to him! holy cow ... well I do like seriously dysfunctional. I loved what I read from the BDB series but this is quite the departure from that. Love your comment about the father leaving a stench wherever he goes. Awesome review Kathryn, has me putting it on my must read list. Yes it is a departure from the BDB. Lots of readers of that I believe are not coping so much with this one. I guess depends on reading tastes and expectations. I liked her BDB - at least ones I read even though not so sure about those baby powder smelling characters! I liked her Jessica Bird books a lot. Will be interesting to see where the next one of these goes.